The Federal Court in its grounds of judgment dated 10 August 2015 in the case of Sinnaiyah & Sons Sdn Bhd v Damai Setia Sdn Bhd has made a significant clarification on the law. The standard of proof of fraud in a civil claim is now only based on a balance of probabilities and not beyond a reasonable doubt. The Federal Court overturned its earlier decisions in Ang Hiok Seng  2 MLJ 45 and Yong Tim  3 CLJ 229. The Federal Court examined the different authorities in the UK, Canada, Australia, and Singapore. The Federal Court emphatically adopted the English position as set out in the House of Lords decision in In re B (Children)  UKHL 35. At law, there are only two standards of proof: beyond reasonable doubt for criminal cases and on the balance of probabilities for civil cases. As such even if fraud is the subject in a civil claim, the standard of proof is on the balance of probabilities. There is no other hybrid or third standard. Neither the seriousness of the allegation nor the seriousness of the consequences should make any difference to the standard of proof to be applied in determining the facts. The Federal Court made it clear however that the judgment only applied to the appeal in question and to future cases, and should not be utilised to set aside or review past decisions involving fraud in civil claims. 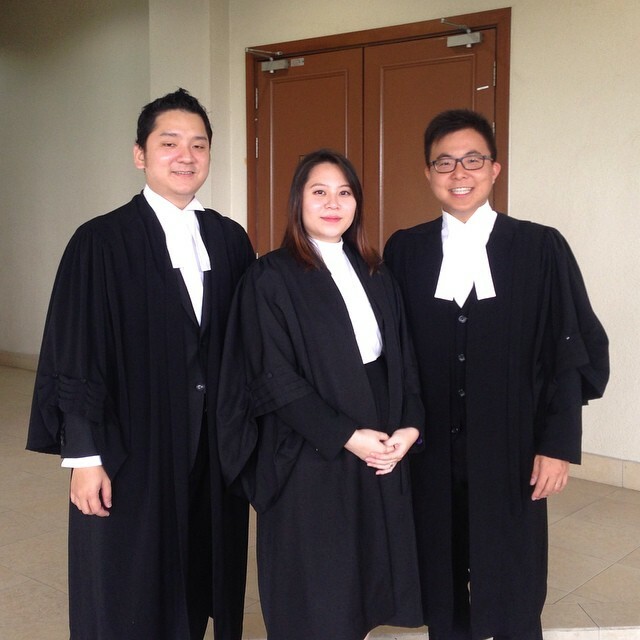 In Malaysia, the admission to the Malaysian Bar is known as the Call to the Bar. It marks a pupil’s qualification as an Advocate & Solicitor. A member of the Bar with more than 7 years of experience will move the pupil’s Call, and to submit on behalf of the pupil as to why the pupil now qualifies to be admitted to the Bar. I can do no better than to refer to Fahri Azzat’s LoyarBurok article if you want to read more about the significance of the Mover and the Call to the Bar. Other jurisdictions have started to move to a form of a mass Call and they do away with individual ‘submissions’ and speeches by the Mover. I think it is still a fine tradition to maintain here, despite the length of time taken. It is a delicate balance, with the increasing number of pupils being admitted to the Bar, and with judicial time being taken away. On a personal note, I always get nervous when I have to move a pupil’s Call. Firstly, I recognise that this is a once-in-a-lifetime experience to get Called to the Malaysian Bar. Secondly, it is also not very often that we get a chance to publicly address and thank our loved ones, in particular to express our gratitude to our parents. With all these factors, I always get nervous in wanting to give the best speech that I can. Most times, I will try to write the speech from scratch, having had a chance to meet up with the pupil for a chat. There was added pressure on this occasion since I was moving the call of a LoyarBurokker who is a pupil of another fellow LoyarBurokker. As the main theme of this speech, I wanted to focus on the term “vocation” since I thought it was very apt in describing Carmen’s future. I am Lee Shih for the Petitioner. My learned friends for the Attorney-General Chambers, the Bar Council and the Kuala Lumpur Bar Committee have been introduced earlier. With leave My Lady, allow me to introduce the Petitioner. The Petitioner was born on 6 November 1989. She is the eldest child of Mr Tham Kam See and Madam Chan Soo Kum. The Petitioner’s father cannot be in Court today but the Petitioner’s mother and sister are present in Court. My Lady, the Petitioner read law at Aberystwyth University in Wales and graduated in 2010. She completed her Bar Professional Training Course at City University, London, and she was called to the English Bar at the Honourable Society of Inner Temple. The Petitioner then completed her pupillage under my learned friend, Marcus van Geyzel, of Peter Ling & van Geyzel. At the Petitioner’s Call to the Bar today, I think it is apt to draw our attention to the term “vocation.” Vocation is derived from the Latin word meaning “to call.” Hence, I find it very accurate to describe the legal profession as a vocation. Being members of the legal profession, we answer the call to serve others. Now, having completed her 9-month journey as a pupil, the Petitioner is about mark her entry into this vocation of the legal profession. In addition, the Petitioner is also about to complete another significant 9-month journey. Soon, the Petitioner will mark her entry into another vocation; the vocation of motherhood. Both vocations will be a lifetime journey for the Petitioner. They will be filled with some challenges, but I have no doubt that both will bring her much pride and happiness. 1. Firstly, her parents, Mr Tham Kam See and Madam Chan Soo Kum, for having sacrificed so much for her. In my conversation with the Petitioner, the Petitioner described her father as loving but stern, and who instilled a lot of discipline in the Petitioner. Mr Tham, the sole breadwinner in the family, through his hard work provided her with the best education that she could ever ask for. Madam Chan, on the other hand, provided the whole family with delicious meals every day. A dish is never repeated, and Madam Chan would have drawers after drawers filled with recipe books. Madam Chan’s cooking would be the impetus to draw all the family members back home to have dinner together. 2. To her spouse, Mr Clinton Wong, for being her pillar of strength and for his unconditional care and love throughout Bar school and pupillage. 3. To her colleagues, former colleagues and bosses in Peter Ling & van Geyzel, particularly Li Ying and Jin for making her pupillage experience rewarding, unforgettable and fun. 4. To her pupil master, Marcus van Geyzel, who, in her words, is the coolest pupil master ever and also a very good friend who has imparted on her great knowledge and wisdom. As I have known the Petitioner’s pupil master for years now, I have no doubt that he would have bestowed some of his wealth of sartorial sense on to the Petitioner as well. 5. Finally, the Petitioner would like to thank her friends who took the time and effort to be present here today to witness this special occasion. My Lady, I believe that the Petitioner’s papers are in order and that the relevant bodies have no objections. I humbly pray that the Petitioner be admitted and enrolled as an Advocate and Solicitor of this Honourable Court. I seek leave from this Honourable Court for my learned friend, Marcus van Geyzel, to robe the Petitioner. I will be speaking at the University of Malaya Law Career Convention 2014 tomorrow from 12-1pm on a topic entitled “10 Things I Wish I’d Known as a Young Lawyer.” You can click over to my Prezi presentation (I can’t seem to embed it anymore to WordPress). Also, I set out below a list of recommended reading which I will be referring to in my talk tomorrow. Lexis MLJ alerts and CLJLaw alerts. Modern Advocacy Perspectives from Singapore – each chapter is written by a Senior Counsel to shed their thoughts and tips on the litigation process. Ladies and Gentlemen of the Jury: Greatest Closing Arguments in Modern Law – in particular, the closing arguments for the Nurenberg trial is awe-inspiring. Storage of all information, contacts and calender on the cloud. A book on Accounting and Finance for Non-Accountants. Andrew Ross’ Too Big to Fail – blow-by-blow account how the global financial crisis started. Harvard’s class of 1963 “If I Knew Then“. Tommy Thomas’ article on The Last Lawyers Standing. LoyarBurok’s Essential Tips for Law Firm Applications and Interviews. Dress Like a Lawyer: 5 Tips for Building Your Pupillage Wardrobe. A useful post on when joint privilege may apply, with reference to the English High Court decision of R (Ford) v The Financial Services Authority  EWHC 2583 (Admin). Joint interest privilege arises in cases where two separate parties can claim a joint interest in communications with a particular lawyer, and therefore it can only be waived jointly. An example of where joint privilege might arise is in the management of a company; where the legal interests of the company and its directors will often coincide or overlap. However, in such scenarios, unless the lawyer is formally retained by both the company and its directors (to advise the directors in their personal capacity) then it does not automatically follow that the directors can claim that any particular communication is subject to joint privilege. the communication with the lawyer was confidential. Legal Professional Privilege to Extend to Accountants’ Advice? The UK Supreme Court in Prudential plc and another) (Appellants) v Special Commissioner of Income Tax and another (Respondents) is presently hearing an appeal on whether, at common law, legal professional privilege (“LPP”) applies to communications between a client and an accountant seeking and giving legal advice on tax law. At first glance, it would appear that the answer to this question should be no, since LPP seems to require a lawyer to provide advice. It will be interesting to see if the Supreme Court decides to extend LPP so widely to cover accountants’ advice. I will update this blog on this Prudential decision once I read about it. In the meantime, I came across an interesting blog post on the issues and facts of this Supreme Court case on Global Corporate Law. It is a good step that the Federal Court now releases a media summary along with its Grounds of Judgment. I recall reading the Chief Justice stating that the Judiciary would now take that step so it is good that we now follow suit with other countries like Singapore and the UK. Federal Court appeals should after all only deal with novel questions of law and questions of public importance so the media summary would help to educate the public at large on the significance of the decision. However, the first Federal Court decision that comes with its Media Summary deals with a rather procedural and technical area of the law. The question being whether a failed attempt at setting aside the service of court papers out of jurisdiction (under Order 11 of the Rules of the High Court 1980) would then still allow for a successful striking out of the action (under Order 18 Rule 19 of the Rules of the High Court 1980). Not exactly the decision to digest and not with the widest application. But this step of releasing a media summary is something to be applauded.